So yesterday I borrowed one of my poor guinea pig students to train working on private 1-2-1 ‘on the bar’ double tuition with me! I am loving the beauty of the mirrored moves that can be created with the cube. The first part of this video was planned, the second part was just freestyle as we came up with the last moves on the spot just as we were about to finish. 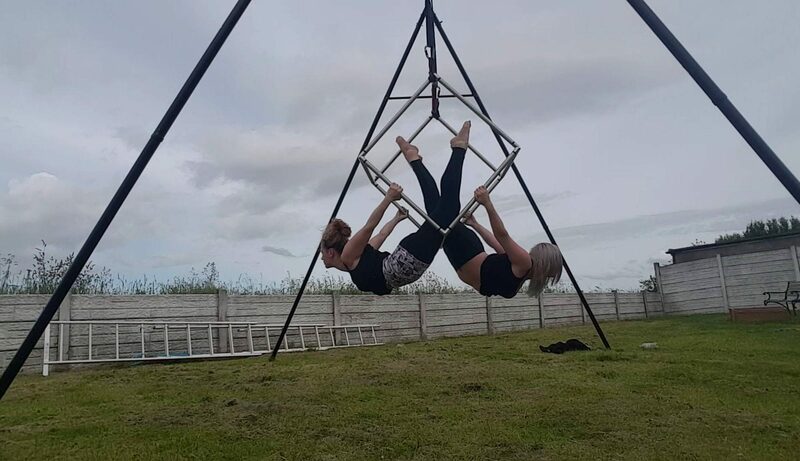 Unfortunately we had already lowered the cube because we had been practicing top bar moves in-between, so Sian ended up eating grass in the final single toe hang haha! Sian was specifically helping me train with one-on-one sync in an ‘on the bar’ talk through tuition. I think you will agree it worked very well. I look forward to more double on the bar tuition. If you would like a private aerial hoop or cube class at CrossFit in Leyland, in my training room at home, outdoors depending on weather or in your own home (dependant on ceiling height), please do not hesitate to ask. Due to obvious reasons, one-on-one ‘on the bar’ cube double tuition with me is not for beginners and can only be carried out with students I have taught for long enough to thoroughly know their capabilities!